January 19, 2010 - One of the greatest challenges in this relief operation has been lack of infrastructure, which has significantly slowed the delivery of supplies and workers to the greatest points of need in Haiti. 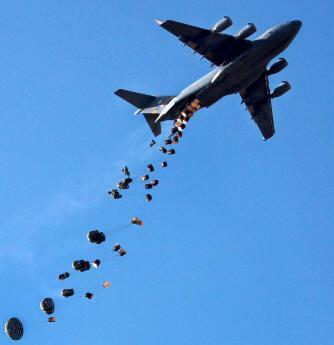 Airdrop is one of many options the international community is using in order to create alternate distribution points that will enable aid to reach the people more quickly. Airmen from U.S. Southern Command's air component, Air Force South, conducted an airdrop mission on Monday in an effort to provide an alternate distribution point for relief supplies to Haitian earthquake victims. The mission was planned and executed by Airmen at Headquarters Air Mobility Command, 18th Air Force and the 618th Tanker Airlift Control Center. The C-17 Globemaster III, crewed by Airmen from the 437th Airlift Wing at Charleston AFB, S.C., departed Pope AFB, N.C., and delivered 14,000 Meals Ready-to-Eat, or MREs, and 14,000 quarts of water in the 7 hour round-trip mission to Haiti. To ensure the safety of the Haitian people, service members with Joint Task Force-Haiti secured an area in which to airdrop the supplies. Once on the ground, supplies were distributed by JTF-Haiti, USAID and other relief personnel. "When we arrived on the first evening with three U.S. aircraft, within 28 minutes we established command and control, airfield management, and were able to land aircraft that night," said Col. "Buck" Elton, Joint Special Operations Task Force commander. "On a typical day, the Port-au-Prince airport lands about three aircraft. Since we landed Wednesday, over 600 aircraft have landed and taken off." As of Friday, Haitian air controllers returned to duty, providing long range control while the combat controllers prioritized incoming aircraft, directed landings and take offs while balancing confined parking ramp space. According to a factsheet released by Air Force South officials, the Haiti Flight Operations Coordination Center has been created to oversee the efficient arrival, off-load and departure of military and civilian relief efforts to provide much-needed aid to the Haitian people. All aircraft delivering aid will be allowed to land on a prioritized basis. Priorities and landing times are determined by the Government of Haiti in consultation with the United States government and the UN Mission in Haiti based on current needs. "By using the slot system, we have been able to maximize the number of relief supplies the airport has been able to take in," Colonel Elton said. "We have it so that when one aircraft departs, another takes its place." So far, more than 600,000 humanitarian daily food rations have been distributed throughout Haiti, along with water and hygiene kits. "We're diligently working with the Haitian government to prioritize distribution sites," said Mr. Tim Callahan, the senior regional adviser for Latin America and the Caribbean in the Office of Foreign Disaster Assistance. "Hygiene kits are becoming more and more important, preventing further medical symptoms from occurring." On Jan. 16, Air Force Special Operations Command pararescuemen along with Search and Rescue members from Arlington, Va., pulled a 25-year-old Haitian female from the rubble at the university. It took them 28 hours to rescue her. She was treated by 1st Special Operations Medical Group surgeons. Joint international work has been the underlining theme in the Haiti humanitarian mission. "International search and rescue teams have rescued 61 people as of Sunday afternoon," Mr. Callahan said. "Out of the 61 people rescued 29 we're rescued by U.S. joint teams." "Seeing the teams on the ground digging people out and making rescues is very powerful," Mr. Callahan said. "I'm proud of all the quiet professionals who are deployed here," Colonel Elton said. Airmen have performed a wide range of missions to include medical support, airfield management and weather observation in the devastated country, which suffered a 7.0 magnitude earthquake and numerous aftershocks.